Quintegra offers product services under its proprietary methodology called ProCoDe (Product Co-Development). The differentiating factor of our product services is the emphasis on collaboration among clients and Quintegra. Through this approach, Quintegra not only offers the traditional benefits of offshoring product services but also provides the features of a captive center including total control over operations, high degree of transparency and complete protection of IP. Quintegra’s ProCoDe services range from product application design and application development, product quality assurance and testing, to product maintenance and support. We offer ISVs both point solutions as well as turnkey solutions, such as comprehensive user support services. We have an established process for companies seeking to establish a dedicated Offshore Development Center, allowing them to begin with project-based engagements and progress over time to managed operations in a joint venture or other structure designed to suit their needs. Taking a product from concept to reality is a complex and arduous process. Quintegra assists ISVs in this respect by tailoring product services that best fit our clients’ business requirements. Quintegra has developed a detailed product road map with comprehensive service offering for each constituent. The core emphasis is on collaborative end-to-end process cycle, which leverages upon joint learning curves, while providing greater flexibility, cost advantages, and compressed time to market benefits. 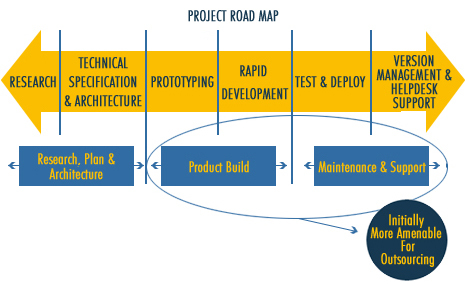 While certain elements of the product road map are initially more amenable for outsourcing, Quintegra can collaborate with clients for end-to-end product services. Whatever the needs and timelines be, Independent Software Vendors (ISVs) can trust Quintegra to deliver measurable success through product services.